The Coalition of Domestic Election Observers (CODEO), has set the record straight on Ayawaso West Wuogon by-election regarding Electoral Commission of Ghana’s misrepresentations on the shooting incident at La Bawaleshie. In reaction to EC’s misrepresentations, CODEO stated unequivocally that they do not rely on hearsay or uncorroborated third-party accounts. The National Coordinator, CODEO Mr. Albert Arhin, made this remark during a media encounter in Accra. “CODEO follows a strict protocol and has, thus, always taken great pains to ensure that its Close Of-Poll Statement and other reports record and reflect only that which is factually and contemporaneously observed and documented by its assigned observers and team,” he stated. 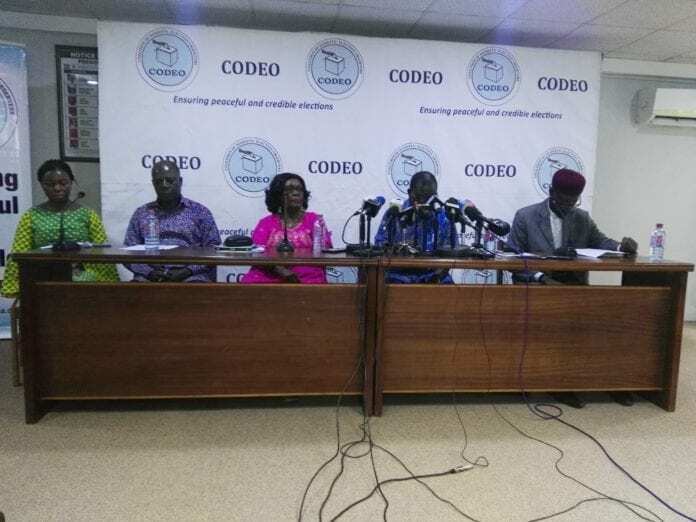 CODEO is, therefore, surprised that claims or assertions it did not make in its initial Statement have been attributed to it by the Electoral Commission of Ghana in a press statement and at a press conference apparently, in reaction to the CODEO statement. On the evening of Thursday, January 31, 2019, the Coalition of Domestic Election Observers (CODEO), which had deployed observers for the Ayawaso West Wuogon Constituency by -election held on that date, released its Close-Of-Polls Statement. CODEO’s Close-Of-Polls Statement typically provides a snapshot of what transpires on Election Day. Consistent with its practice, CODEO communicated its initial report of the election not only to the public, through traditional and new media channels, but also to the leadership of the Electoral Commission (EC) via e-mail. CODEO observers witnessed the violent incident, including shooting incident, which took place in the La Bawaleshie area at East Legon. While the observers could not confirm the exact cause of the violent incident, CODEO is disappointed that an electoral exercise was subjected to such violence which temporarily disrupted voting. • Observers noted a generally low voter turn-out across the constituency. At the commencement of polls, most polling stations had political party agents present, particularly from the New Patriotic Party (NPP) and the National Democratic Congress (NDC). CODEO observers, however, noted the subsequent withdrawal from some of the polling stations observed of NDC agents. CODEO is also alarmed about the apparent lack of proper security coordination for the election: o The observers noted several instances of heavy – and intimidating – security presence at most polling stations observed. Many polling stations had not less than five uniformed security personnel, and in some cases, as high as 15. o At the Dzorwulu JHS, for instance, two adjoining polling stations had a total of 13 uniformed security personnel as well as a number of non-uniformed security personnel. At the Christian Book Centre at East Legon, nine (9) uniformed security personnel and other non-uniformed security personnel could be seen at the two adjoining polling stations. o Many polling stations also had security agents in plain cloth, some of whom claimed to be National Security operatives. o Some polling stations had separate security teams from the Police, the Immigration Service and ‘National Security.’ o Polling stations were frequented by mobile patrol teams of security personnel sometimes at short intervals of less than thirty minutes. Even more worrying was the presence of masked security operatives at polling stations, who could not easily be identified and thus could not be held accountable for any misconduct. • Some non-uniformed security operatives displayed lack of understanding of the electoral rules and regulations. At the Prisons JHS at Roman Ridge, for instance, security operatives who claimed to be National Security operatives positioned themselves next to polling officials and when a stationed uniformed police officer alerted them to move away from poll officials, a pick-up full of many more of the so-called security operatives descended on the police officer and attacked him for doing legitimate work. Apart from the above listed incidents, most observers reported of a generally smooth voting exercise, including the smooth performance of biometric devices. Conclusions CODEO questions this high level and, what appears to be, uncoordinated security arrangement and presence during the elections. Unlike previous arrangement which seems to have been working well for the country during elections, CODEO is unsure what role, if any at all, of the Election Security Task Force played in this election.